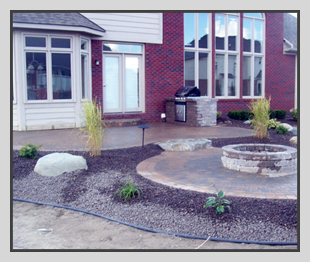 Medaugh's creates dramatic hardscape features in Macomb, Oakland and Lapeer counties such as paths, walkways, walls, outdoor kitchen areas and steps. We can even create stone firepits, fish ponds and water features or pool surrounds. Our pavers are the ideal product for Michigan's freeze/thaw environment and they provide a rigid pavement that is flexible when it counts. Joints between the pavers allow a walkway, path or driveway to move without cracking. They also provide excellent drainage when it rains or when the Michigan snow melts. Our interlocking wall systems are sturdy and beautiful. We can terrace your garden to not only prevent topsoil erosion, but to provide numerous areas for dramatic plantings and landscape features.